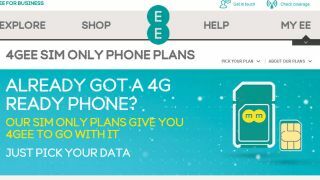 EE, the UK's first network to offer 4G has finally launched its SIM-only tariffs, almost a month after the superfast network strode onto the scene in Britain. Plans start at £21 per month on a 12-month contract – no rolling 30-day deals here – which gives you unlimited texts and calls but just 500MB of data. If you need more data each month, EE offers 1GB, 3GB and 5GB tariffs, priced at £26, £31 and £36 respectively. While EE will argue that you'll be getting superfast speeds, allowing you to download apps and videos in a flash while you stroll down the street, it's hard to ignore offers elsewhere for the data hungry among us. Over at giffgaff, for example, you can pick up 250 minutes, unlimited texts and unlimited internet for £12 a month – there's no 4G, but at almost half the price of EE's cheapest offering it's well worth considering. The good news is EE does provide nano-SIMs if you fancy picking up a new iPhone 5 SIM-free and then going down the 4G SIM-only route for a year. Plus you can use your handset to tether your web connection to other devices - although this will likely see you chomp through your allowance in double quick time.